People always ask me, upon spying this item, if it’s a hat. It could be. Tea cosies (British spelling) look like hats, and winter hats, particularly polartech ones, make passable tea cosies in a pinch. 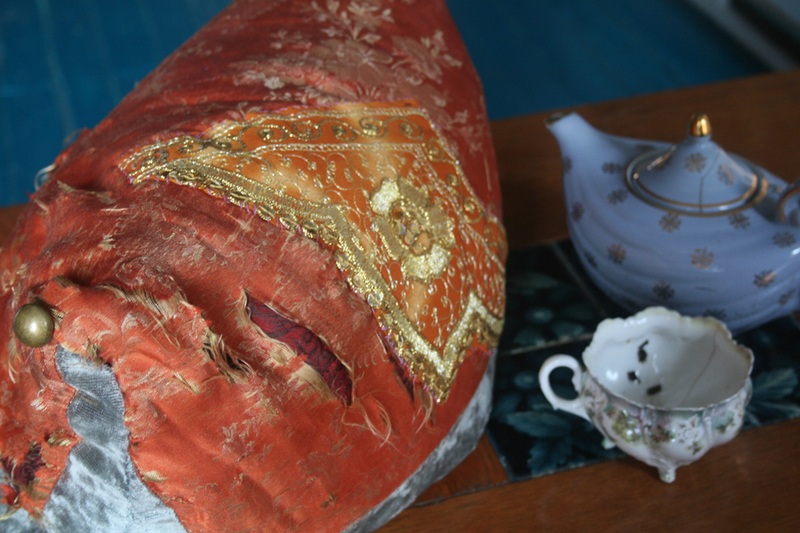 I took my childhood down pillow that had finally gotten beyond the point of providing any pillowing, folded it in half and stitched up the sides. The cover is made from a beautiful dissolving silk and velvet pillow case from my great grandmother. The fabric frays every time I touch it. In an effort to protect it, I appliquéd a piece of gold embroidery from an Indian dress. So far it is fine. I’ll just keep patching it as it tears. Tea Fact: Tea is a natural source of fluoride that can help protect against tooth decay and gum disease. Tea History: War. Taxation. Tea. Britain. 18th century. Tea was a very profitable smuggling commodity, even more so than gin and brandy. Tea smuggled in yearly at this time was between 4 and 7.5 million lbs, significantly more than was brought in legally. Everybody knew that high taxation encouraged smuggling, and the quantity of tea being smuggled was directly linked to the level of duty levied on legal tea imports. At the beginning of the eighteenth century, the government´s need to finance a war in Spain led to an increase in taxation on tea, and the price of leaves rose to 5s per lb in 1711. TOOTH DECAY FACT: Well, I have been dying to tell some people this, and here seems apropo and at least many will see it, I hope. SECRET: I began increasing my intake again, after a default of use for a few years, of the liquid EXTRACT OF STEVIA…this is the ONLY change I made to my diet! Well, I am just speechless myself, about the stuff….!! There. Someone knows. Amazing, eh?